Published on YouTube, 12 Feb 2015. Published on YouTube, 19 Nov 2014. The above has been copied from the Novorossiya Video-News page. It is a short interactive video which has different outcomes depending upon which choices the viewer makes. Whilst the subject matter behind this video is grim – the war inflicted upon the Russian speakers of East Ukraine by the Kiev regime – and may become even more so should Prime Minister Arseniy Yatsenyuk of the All-Ukrainian Union "Fatherland" Party achieve his wishes of having the NATO powers intervene to support an all-out invasion of Novorossiya, the video retains wit and good humour. Updates prior to 9 Aug 2014 can be found here. The basis of the article is just wrong, or very heavily biased. This is the current leader. They are not leaders of 'neo-nazis'. The fact that neo-nazis were in the street fighting against the previous government means nothing. Leftists groups were fighting for the same thing. When it comes to political struggles, its the extremists who will take to the streets. You basically have Ukranians who want to align with Europe and the EU (god knows why), and others who want to align with Russia (it is about 1/5th ethnic Russians). Russia is now upset because they might lose power over Ukraine. Also, there is a long history between those two countries. I wouldn't blithely write off russophobic sentiment as just some irrational intolerance. Now I can understand why Russian news sources might want to demonise the current government, but well, they have an agenda, don't they? Your view that the Ukrainian government is not neo-Nazi, but rather extremely right-wing and pro-imperialist, concurs with that of Thierry Meyssan of Voltaire Net. I had only just now added the link to his article and plan to publish it in full. On most contentious issues in recent years. Thierry Meyssan has usually been amongst the first to have got it right. Whilst Thierry Meyssan has got it right, other alternative sources which are usually right and which I have cited have also got it wrong on this occasion. If you read the paragraphs following the sub-heading "The broader historical context" you will see that I have not "writ[ten] off russophobic sentiment as just some irrational intolerance.'" 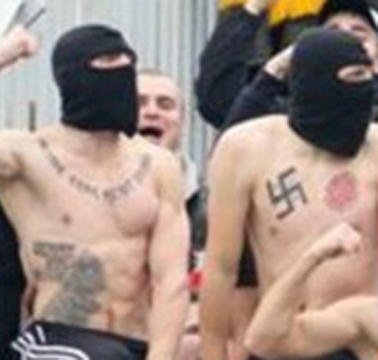 I can't find much which paints the Ukranian Fatherland party as far right. My position is that the far right succeed due to the absense of political alternatives and being the only ones willing to fill a particular political vacuum. Claims Ukraine article "biased and incorrect"
Subject was: "Biased and Incorrect". The German newspaper Der Tagesspiegel (Daily Mirror) launched an online survey on March 6th, asking its readers how the West should react with regard to Russia’s incursions into Ukraine. What follows were the different answers from which the readers could choose. By four o’clock in the afternoon, 9420 readers had answered the survey, and what they had to say filled the presstitutes from the Tagesspiegel with sheer horror. Because only a puny four percent, and we know who those are, favoured a military intervention by NATO forces. Whereas a staggering seventy eight percent believed that Western hacks like Kerry or Merkel were mere hypocrites and that Russia defended indeed legitimate interests. So what happened? At four o’clock and five minutes, the survey was abruptly taken off the net and never seen again. Which clearly indicates that the propaganda lies of our hostile elite and their once invincible media outlets are losing ground. And which, as you will agree, is a ray of hope in the murky Western skies, particularly since the once so totally indoctrinated and docile Germans are seemingly waking up. This is the side that the US/NATO/Australia is supporting. Note 'special troops' launched to deal with citizens' protests. Citizens were marching at a day of commemoration of 2nd World War when they heard that their self-defense people were under attack. The crowd rushed from the parade to their aid and Kiev militia shot to kill - unarmed citizens. The US foreign affairs woman mis-represented what was happening as Kiev putting down violence initiated by the townspeople of Mariupol, but it was tanks against little old people and unarmed citizens and someone had set fire to the building where the self-defence forces had occupied. Even an unarmed camera man for a news crew was shot in the stomach by Kiev snipers it seems.